Whether you&apos;re in town for the Indianapolis 500, celebrating the end of the school year or simply looking for something to do over Memorial Day weekend, Hendricks County, Indiana, is the place to be. We are waving the green flag on the unofficial start of summer with some ballet, water fun, a festival, some frogs and of course a whole bunch of racing. The Children&apos;s Ballet presents its spring performance, "The Golden Cuckoo," on Thursday evening at 6:30 p.m. and again on Saturday at 2 p.m. in the Danville Community High School auditorium (for directions, click here). The original ballet follows the story of a group of toys seeking their friend, the golden cuckoo, who has been taken by a team of cat burglars to the castle of a queen bird who is under an evil spell. This is a fully-staged production with more than 120 local young people dancing with costumes, scenery and props. Dancers range in age from 3 to 18 years old. Tickets are just $10 per adult and $5 per child and can be purchased online by clicking here. Race fans, are you having a hard time waiting until the Greatest Spectacle in Racing? Come on out to Lucas Oil Raceway in Brownsburg on Friday for "The Race Before the 500" -- the Carb Night Classic. The USAC Silver Crown Series, USF2000 and Pro Mazda Series all battle it out on the oval track with the grandstands opening at 2:40 p.m. General admission tickets are sold at the gate for $25 per person or $10 per child ages 11 and under. Silver Crown practice begins at 3 p.m., followed by qualifications at 5 p.m. The USF2000 and Pro Mazda Series features begin at 6:10 p.m., and then snag the autographs of your favorite drivers beginning at 7:15 p.m.
At 8:15 p.m., fasten your seatbelts for the white-knuckle action of the Silver Crown Carb Night Classic! 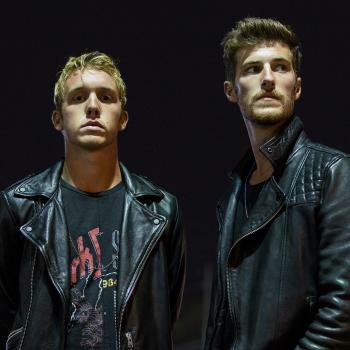 Headlining the live music is the Indianapolis-based, electro-pop duo Dream Chief. Cousins John and Luke Tuttle create music influenced by 80s synth pop with catchy guitar leads and layered synthesizers and have become one of the most promising new acts from the Midwest. Other musical performances during Friday Fest include DJ Fly Ty Simmons, Take Four and Moment 44. Friday Fest is free to attend. Food trucks will provide a variety of eats available for purchase. We will have much more information coming up later this week at this link. But here&apos;s your reminder that Memorial Day Weekend always serves as the unofficial kickoff to summer as all of Hendricks County&apos;s water parks and splash pads open, including the popular Splash Island Family Waterpark. Let the sun and fun begin! 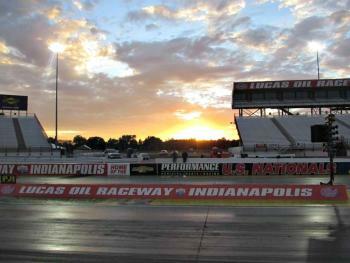 Race fans will want to return to Lucas Oil Raceway in Brownsburg on Saturday -- this time, to the drag strip -- for the inaugural Night of Thunder, featuring the NHRA Real Pro Mod Association. 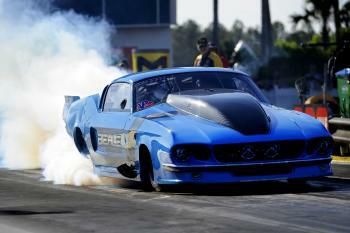 This is a great event to experience, especially if you&apos;ve never before witnessed drag racing. These dragsters thunder down the quarter-mile strip at speeds exceeding 250 mph, with their engines generating up to 3,000 horsepower. By comparison, IndyCar Series race cars produce somewhere between 550 and 700 horsepower. The gates open at Lucas Oil Raceway at 8 a.m., and qualifications for the Pro and Super Pro drivers begin at 10 a.m., lasting until about 5 p.m., when autograph sessions and other fan activities begin. Then fans will be treated to two rounds of Pro Mod qualifying, followed by the top 16 drivers going toe-to-toe in the elimination round beginning at 7 p.m.
There’s more fun after the racing, so make sure you stick around for the jet cars -- yes, cars propelled by jet engines -- and an impressive fireworks display to cap off a fun evening! Tickets to Night of Thunder are on sale now by clicking here or by calling (317) 969-8600. General admission tickets start at $20 in advance and $25 on race day. Kids ages 12 and under are $15 in advance and $20 on race day. Parking is free, and every ticket is a pit pass, so don’t miss out on your opportunity to meet your favorite drivers! For more information about Night of Thunder, click here. If being serenaded by Mother Nature rather than hearing the deafening roars of 3,000 horsepower is more to your liking, bring the family out to McCloud Nature Park near North Salem on Saturday evening at 8:30 p.m. for Hendricks County Parks & Recreation&apos;s Frog Calls Night Hike. McCloud Nature Park is 232 acres of natural beauty. Normally the park closes daily at dusk, but on Saturday night, park naturalists will lead families around the park. Specifially to the best spots to find the resident frogs that fill the night air with their calls. Are you unfamiliar with frog calls? Don&apos;t worry. The naturalists will explain them to you as you hike. Advance registration is required by midnight on Thursday (it&apos;s only $3 per person), so don&apos;t miss out! Register by clicking here! With ballet, live music, water adventure, sprint car racing, drag racing, frogs and all sorts of other things to do over Memorial Day weekend, where else would you rather be than in Hendricks County?